Hazle Drugs Inc. provides REIKI HEALING SESSIONS in our Natural Health Care Center. Reiki is performed by our very own Reiki Master: Rosemary Broody. Reiki, pronounced “ray key”, means universal life force. Reiki is an ancient laying-of-hands system of healing. It clears and opens the energy pathways of the body. It reduces stress and allows the body to heal itself. It is a very simple, yet powerful healing technique that can easily be learned by anyone. 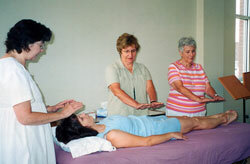 Reiki sessions are designed to gently harmonize and restore the client’s energy centers in the body. Special attention and care is given to any area in the personal energy field of the client that may be out of balance. Our Reiki Master, Rosemary Broody will make you feel relaxed, vibrant, centered and at peace. She will guide you to a restful place, often into a meditative state and then will access and balance your energy. The client will be treated in a soothing, relaxing environment at our Natural Health Care Center. Reiki is not a religion. It is based on compassion and love for each other. When you reach out to others, you will notice changes in yourself. You will find a sense of empowerment in your life. You can make positive changes and be filled with all the possibilities life has to offer. For more information and to schedule a Reiki Healing Session, please contact Hazle Drugs Reiki Master, Rosemary Broody at Hazle Drugs Natural Health Center 570-454-2476. We also offer classes for the 3 levels of Reiki Certification if you are interested in becoming a Reiki Practitioner. Call to inquire when classes are being held.